donate to loaves and fishes! In the parable that our Lord told of the rich man and Lazarus, the rich man stepped over Lazarus as he lay sick and hungry on the rich man’s front porch. Our food program for the poor began in a similar fashion. Our church is located in the heart of the city of Atlanta in what used to be a very poor area. We have literally stepped over people asking for food and money as we have come and gone from our church. We have often walked out of church after services and been met by someone asking for money or food. I am reminded of the early days of Peter the Publican (Sept. 22), who later became a great saint. In his early days Peter was stingy and never gave the poor a thing, even though he was quite rich. One day a poor man bet his friends that he could get a loaf of bread from Peter. Peter was carrying a large load of bread home from the marketplace when the poor man stood in his way and asked for a loaf to eat. Peter was so angry at the poor man’s persistence that he took a loaf of his bread and threw it in the man’s face. The poor man took it back to his fellows with much glee. That night Peter fell quite sick. In a delirious state, he saw his soul being weighed by angels and demons. The demons placed all of Peter’s bad deeds on the scale and jeered at the angels because Peter had not even done one good deed to place on the other side. After some thought, one of the angels placed the loaf of bread that Peter had thrown in the poor man’s face on the other side of the scale and it balanced his bad deeds. Peter immediately woke up and realized that if he could gain so much grace from his uncharitable act of charity, how much more could he gain if he actually was charitable. He repented his early life and became one of the most charitable men ever to have lived. We were taught from our very earliest experience in the Orthodox Church that we should always give something to anyone who asks of us. At first, responding to the poor quite literally on our doorstep, we gave what was easiest - money. Yet the casual way we were giving money to the poor to get them off our backs felt very much like Peter the Publican throwing bread. So, in a similar manner to Peter, we eventually reasoned that maybe if we made the effort to feed people, perhaps we might do more to fulfill the law of Christ and truly serve our brother man. We drew this conclusion because the tales of woe, abuse, tragedy, fires, death, and sickness that we often heard caused us to ask ourselves questions that we could never answer. Are these stories really true? When should we give? How much should we give? What are people doing with the money that we give them? (Are they using it for drugs or alcohol?) These questions literally drove us to open our food program. Our parish, St. John the Wonderworker (Maksimovich), began its food program in the late 1980s by joining our local food bank and going there on a weekly basis to bring back canned goods to give out to people. One of the programs at the food bank was distributing USDA (US Department of Agriculture) canned goods that we could get for free if we had the manpower to carry away the cases and the willingness to complete the extensive paperwork connected with distribution. It was worth it to us, because at the time USDA canned goods included beef, pork, and peanut butter along with many different cans of vegetables. We could give people a well-rounded allotment of food. At that time we were allowed to give the USDA food to people only once a month. We were giving these food bags to hundreds and hundreds of people. It was very hard to give to hungry people only once a month, so we began to get other food from the Food Bank, food that we had to pay for (at that time 14 cents a pound). There was another problem. Many of the people who came for food were homeless or living in places where they were unable to cook the canned goods we gave them. We found ourselves having to either open the canned goods for people so they could eat right there, or face the likelihood that people would take the canned food and sell it on the street. This system which we had kept in place for ten years, was really not efficient, but we saw no alternatives at that time. Over the years, we saw great economic growth in the Grant Park area of Atlanta, where our church is located. At the same time we saw even more homeless poor at our door. The need was great, and eventually the need was met by all the Orthodox of greater Atlanta, not just our own parish. Many new Orthodox priests had been transferred to Atlanta from the various jurisdictions around the year 2000. They began meeting once a month for fellowship and lunch. We decided to name our brotherhood after SS. Cyril and Methodius. Over the next several years, our relationships deepened and we began frequenting one another’s churches and participating in one another’s parish life. Atlanta’s Metropolitan Alexis, the bishop of the Greek Archdiocese, very much supported our meetings. He wanted us to do more for Atlanta to bring people the knowledge of the Orthodox Church and to assist those throughout the city who were needy. He wanted us to combine our efforts in outreach to the poor. It is from this base of an extremely supportive local bishop and a unified group of local Orthodox clergy that the Loaves and Fishes Food Program was born. We decided that our unified outreach would build upon the food program that was already in place at St. John’s. With the support of the brotherhood clergy, we met with representatives of all the Orthodox parishes to come up with a unified plan. We decided to put food barrels in the narthex of all of our churches (about 15). Since that time, many of the churches have periodically donated food left over from festivals, meetings, and celebrations. The local faithful bring these to St. John’s in addition to canned goods. Very quickly we found ourselves serving hot meals to people. Our food program has served people twice a day, Monday through Friday, and now at one of those times we are able to give a hot meal; at the other time, sandwiches and a dessert. We have lately been serving upwards of 90 people a day in addition to giving bags of food to families. We also have volunteers going to grocery stores and surplus food centers to bring us bread and sweets to augment the meat for sandwiches and the hot food that is being donated. Various churches have begun sending volunteers down to help distribute the food. This involves whole groups of children, including teenagers, who, when they are not in school, come to serve the poor. I coordinate the program at our church, and the president of our local IOCC chapter, Costas Panos, coordinates the food brought in from the parishes. We have one person who is here every day to whom we pay a minimal salary for his labor of making the sandwiches and serving them. We have no set number of people that we need as volunteers on any given day. When someone makes food or soup, he/she usually comes and distributes it. Mostly lay people are involved in all of this, but also many of the local priests bring us food from their parishes. One person, whose job was in food distribution, gave us enough sliced meat to make turkey and ham sandwiches for most of this year. When money is needed to purchase items, we raise that money by e-mail. Costas, who is also in charge of raising money, sends an e-mail to about 200 people he has on his list, and thanks be to God, the money is raised. I have a digital camera and am constantly taking pictures of our giving food to the needy. We send the photos to everyone to let them see where their money and time are going. When the local group of lay people that oversees our Loaves and Fishes Food Program saw that we needed coolers to store the trays of food coming in, they gladly donated the money for a brandnew cooler. They also found a used one as well as an additional freezer. We built, with the money we have raised, two new pantries to store the food, and have even bought a water fountain for the people to get a drink of water on a hot Southern day. We had benches built for the men and women to sit on outside the church and eat their food. We paved the area with stone and planted a garden around the edges so that the yard where people eat would be cheerful and clean. 600 children received toys and over 100 families received food boxes. The homeless display their talents and sings songs they had written. This is not to say that all has been smooth sailing. The church currently has new neighbors who feel that, if not for our program, the neighborhood would be free of the homeless. No city is free of homeless. However, people littering in the park and around homes adjacent to our church has been an issue. We have made an effort to cut back on this problem by restricting what leaves the churchyard to canned goods only. In addition, meals must be eaten in the churchyard and not taken “to go.” In light of this local problem, we actually closed the program for a week recently in order to let the people we feed know that this is a serious issue and that they must respect the neighborhood where food is being served. I believe that as we take care of the needs of the homeless, it reduces much of the crime that is brought about by people’s most basic needs not being met. By feeding the hungry in our area, we have also prevented men from knocking on residential doors, begging for work, food, and/or money. Our defense of the program will probably be our greatest challenge - a challenge that many of you may face as you attempt to open such a program in a residential neighborhood. The good news is that our program has expanded. We now also have: The Loaves and Fishes Christmas Program and the Loaves and Fishes Dinner for the Poor on Christmas Day. Instead of each Orthodox Church doing its own Christmas Program for poor families, we have combined efforts to give all the food boxes and toys through St. John’s. Last year we gave toys to 600 children and food boxes to over 100 families. In addition, we raised enough money to support our food program for the whole year! Yet, we realized that our Christmas Program for poor families did not share the birth of Christ with the homeless. So for the past two years, Orthodox from all over the city have come to St. John’s to serve a Christmas Feast for the homeless in our parish hall complete with presents and Christmas carols sung by some of our local Orthodox choirs. The homeless display their own talents as well, singing songs they had written, reading their poetry, playing the piano, and in general joining into the joy of the festivities. Last year, we were totally inspired by Metropolitan Alexios, who came as well, put on an apron, and helped serve the meals with us all. There is a joy and respect amongst us in this unified service that the Orthodox of Atlanta are doing. I would tell anyone from other cities who wishes to do the same thing that first the Orthodox of the city must be unified and of one mind and mutual respect in Christ before they take on such a task. I do not believe that doing a unified service program will bring unity, but that the program should be an expression of a unity already achieved. Thanks be to God, it is working here. Fr. 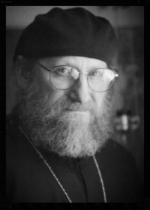 Jacob Meyers was pastor of St. John the Wonderworker Orthodox Church, Atlanta, Georgia until his repose in 2013.